I got down at Kurla at around 1510 - still about an hour to go for the time Arzan told me! I decided to wait for the KR3 passenger. I thought of clicking it at Sion instead of Kurla, and took a slow local. Just as my EMU was pulling out, a WCAM3 rushed off with the Sewagram express bound to Nagpur. Right behind the train, was the WCAM3 that brought the train to Mumbai. I got down at Sion and started searching to a location. I got a good one, but quickly realised that I was right next to a Police Chowky! I took the next train to Matunga. On the way, I crossed the Konark Express. I quickly zeroed in on a spot at Matunga. At around 1535, I noticed a diesel loco smoking up from Dadar. The loco slowly crawled out, and joined the main line just near to where I was standing. 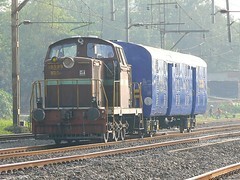 The loco was WDM2 #17983 of Pune. I took another local to get back to Sion. At Sion, I looked at the 6381 (or is it still 1081?) Kanyakumari Express rushing off with a complete SR rake and a WCG2 in charge. The coach positions had completely reversed, and this depressed me bit. The old of this train was outstanding, and I don't know if they would continue the same contractor now! We, on hearing the horn, first thought that it was the Pune bound Pragati. Arzan was disappointed on seeing a WDS4 instead! (I was enjoying looking at the Puny little loco, which is interestingly the only Broad Gauge loco with Hydraulic Transmission on IR today!). We had to change out vantage point since our view was liable to be blocked by Slow EMUs, and we moved over to the otherside. The sunlight was now directly on the lens, and I had to jack up the exposure compensation to get a clearer image. We were quickly greeted by the Pune bound Pragati Express. WCAM3 #21953 was in charge. Since, no action was expected for some time, we moved over to the road nearby and chatted for sometime. We were back near the tracks in time for the Nandigram Express. WDM3A #16013R was incharge of Nandigram Express today. Right behind the Nandigram was a WCG2 hauled train. The loco was WCG2 #20151, and the train had about 10 coaches - 2 SLRs, 7 Sleeper coaches and 1 Pantry. All coaches were of SR, and I suspect it was a Tourist train. There was no action for some more time. Finally, just a few minutes before 1730, WCAM3 #21891 rushed off with the Pune bound Deccan Queen. We decided to call it a day, and both of us walked towards Chunabhatti station which was just 100 metres away from where we stood. I had a ticket, while Arzan purchased one. He was proceeding to Vikhroli to capture some more videos, while I was headed home. I reached home at around 1830, making use of my only holiday of the week. SO it is back to normal tomorrow, with the day beginning at 0500! I think the train number will change only from November 16.